The riders gather their thoughts at Hillary’s tree. Bill Werthmann, Sue Sohnle and Terry Fannon. When Bill told me about his plan to ride a bike across Canada, I thought, “I’ve always wanted to ride across Canada and what better time to do this, with Bill!” As I have learned why Bill wants to complete this ride, as a tribute to his daughter, Hillary, I have become quite happy to support Bill’s tribute to Hillary. Immediately after I said “Yes, I want to join you” I wondered if I could actually pedal across the country. After a year of training, I have become convinced that we can do this. And while demonstrating a tribute and love for Hillary, we can raise funds to support agencies that help Canadians who are struggling with depression. I hope you will join us to celebrate Hillary’s life and support what this ride stands for. 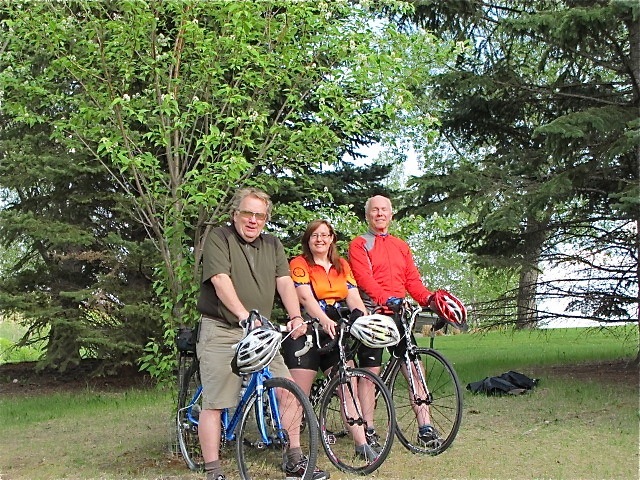 This entry was posted in Riders' Ramblings, Terry Fannon and tagged across Canada, cycling, motivation by Terry Fannon. Bookmark the permalink.